Where do plants come from? From seeds, of course, you say. But where do seeds come from? And do all plants come from seeds? 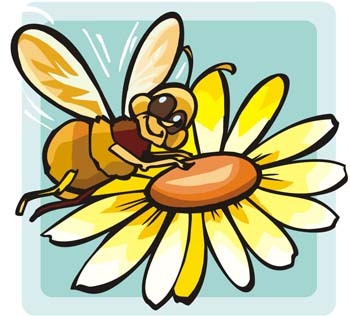 Bees gather pollen from plants to make honey. Some of this pollen falls onto the ovules of a plant instead of being used by the bees. Wind carries pollen from plant to plant in order to make seeds. Rain washes the pollen from the stamens to the ovules so new seeds can be made. Animals eat plants and scatter the pollen to the ovules so seeds can be made. Stop…drop…and roll aren’t just fire safety rules. Many times the pollen and ovules will drop off a plant and fall to the ground. When this happens they can get mixed together so seeds can be formed. Some plants form a single seed for every flower, fruit or vegetable growing on the plant. Other plants, however, have hundreds—even thousands—of seeds in every flower. Once the seeds are formed, they are ready to become new plants. Once a seed is formed, it has to be planted in the ground in order to grow. 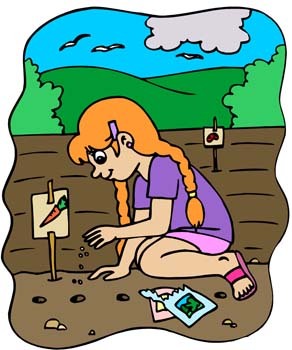 Some seeds are planted by people for growing flowers, fruits and vegetables. Other seeds fall to the grown when a plant withers and dies, OR are blown by the wind, OR are washed to the ground by water. Once the seed is planted, it can begin to grow IF it has enough water, healthy soil and the sun gives off enough heat and energy to keep the soil warm. If a seed has all those things, it will germinate. 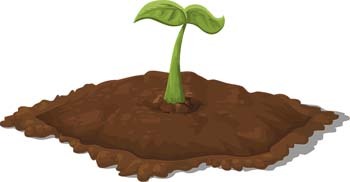 A seed that germinates breaks through the seed coat so its roots can grow in the ground and the stem and seed leaves can pop through the soil and begin making food to feed the plant so it can grow. Once the plant is formed, it grows and grows until it is mature. This means it is as big as it should be and is ready to make fruit, vegetables, flowers, or just more pretty green leaves. NOTE: This depends on what type of plant it is. …and let the seeds from these things start their job all over again. The answer to this question is no. All plants do NOT start from seeds. Only flowering plants (fruits, veggies and nuts are flowering plants) start from seeds. Moss grows from spores. Spores are plant cells that reproduce without needing to pollinate. The male and female spores come together to grow new moss. Other plants are started from tubers suckers or runners, which are part of the plant’s root system. The tubers, suckers, or runners can be separated from the original plant and planted in the ground or a pot of soil to form new plants. 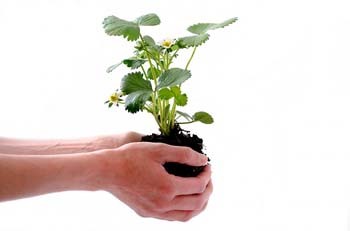 Grafts or cuttings are another way to grow new plants. When a plant is grafted, you join two different plants together to grow a new plant. Grafting is not easy to do and must be done just right in order to work. Cuttings is a much easier way to grow new plants. To grow a new plant from a cutting, you place the stem-end of a leaf or a healthy section of the plant’s stem in the soil so it can take root. Plant three different kinds of seeds; sunflowers, green beans and zinnias are easy. Watch each plant grow and watch how the bees pollinate them. Take pictures of all the flowers and plants in your yard or neighborhood. Label them annual or perennial. Ask friends or family members for leaves and tubers or runners you can start new plants from. But…not every seed becomes a plant.